In between UE conventions, the elected General Executive Board and national officers issue statements applying UE policy to specific issues of the day. UE policy is set by rank-and-file delegates to our biennial national convention. On Monday, the US administration announced an outline of a possible trade deal with Mexico. The projected framework offers few details about improving workers’ living and working conditions and the enforcement of labor and environmental standards. Furthermore, it completely excludes Canada which means it is no longer a North American agreement. UE policy, passed by delegates to our 75th Convention last August, calls for “an end to mass incarceration.” The militarization of immigration policy, begun when ICE was established, has resulted in mass incarceration of immigrants, including children, in detention centers reminiscent of concentration camps. 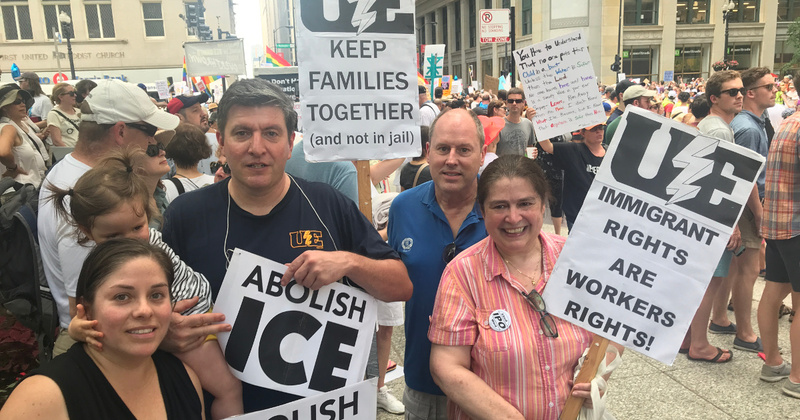 Therefore, we join the call made by immigrant rights groups and others to abolish ICE and replace it with a demilitarized immigration agency supportive of people’s civil, human, and asylum rights free from repression and persecution. The UE General Executive Board, meeting in Pittsburgh from June 5-8, 2018, adopted a statement condemning the killing of Palestinian protesters and attacks on the First Amendment rights of Americans to engage in peaceful protest of Israel's military policies. The UE General Executive Board, meeting in Pittsburgh from June 5-8, 2018, adopted a following statement endorsing and calling for support of the Off Fossil Fuels for a Better Future (OFF) Act, HR 3671, and the Clean Energy Worker Just Transition Act. 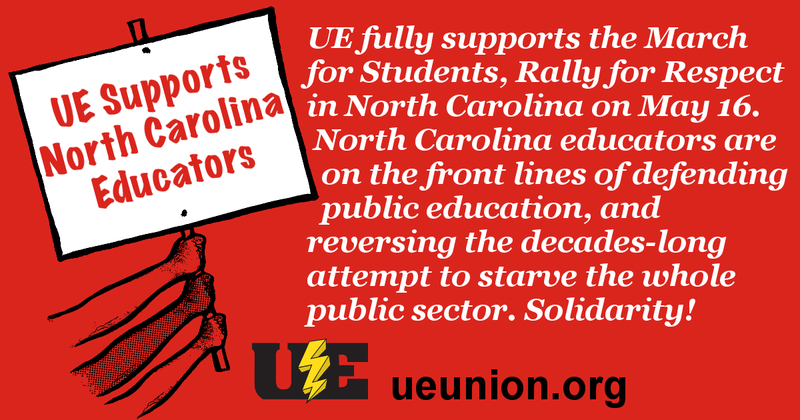 UE fully supports the March for Students, Rally for Respect being organized by teachers and other education workers in North Carolina on May 16th.